Embarrassing myself every time I have to come up with a new blog post title. Someone help me. Can't believe my third semester is over! Finally on winter break and I'm leaving for Ecuador on the 23rd. :D So EGGcited for the warmth. 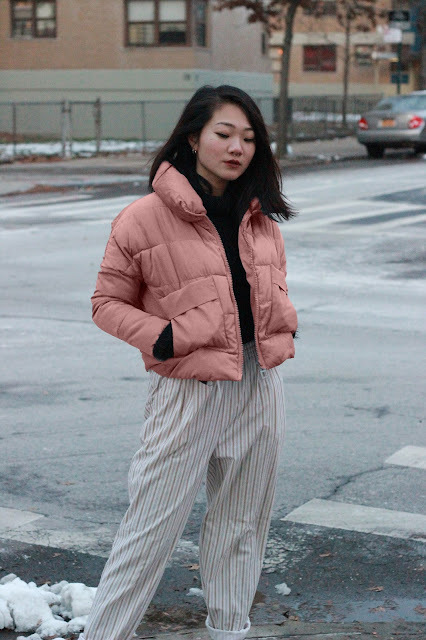 The puffer jacket is the same in my last blog post—I just photoshopped it pink so it would match my pants more! What do you guys think? Mauve or periwinkle? You are too cute and totally pajamin! Those pants look so comfy and I love the color of that puffer here. Congrats on finishing your third semester! I'm in the same boat as you—college sophomore! Loving the pants! I love the look. I feel like i would do this too.